Successful spiritual living doesn’t just happen. It takes training in the truth. Training that only comes when we hold to the fundamentals of the faith. And today, Ron Moore continues that training from an ancient document. Can you trust the integrity of God’s Word? After all, it did pass through the hearts, minds and hands of countless sinful men. Ron Moore comes to offer convincing evidence that the Bible is true and worthy of your trust. Where does the Bible fit in the context of truth and life? Does it really matter and is it truly reliable? Ron Moore will offer that context so that you can discover the importance of God’s Word for every circumstance and every need. Ron Moore wants you to look forward to such moments in the days ahead. He takes you to that place in his engaging devotional “The Greatest Text Message.” There, in bite size meditations, Ron lays a solid foundation for the authority of the Bible. You’ll discover the men God used to communicate His Word, the supernatural preservation of the scriptures down through the centuries, and a new call to embrace its living truth. 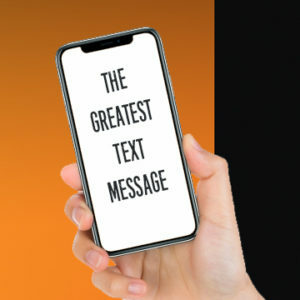 “The Greatest Text Message” is yours for a donation of any amount.